Wabek School, located about three miles south of Plaza in Mountrail County, is a unique two-room schoolhouse constructed from two separate one-room schools. The school comprised the Charipar School building (originally located six miles to the east) and Worsley School building (originally located five miles to the south). These buildings were both moved to Wabek School’s current location in May 1917 and joined by a central addition, including a bell tower. Construction was completed in October 1917.1 The consolidation of small, rural schools into larger ones like Wabek School was a key component of education policy in North Dakota during the early twentieth century. Financial aid from the State Board of Education and its continuing promotional campaign encouraged school consolidation in the early 1900s. This map shows that by 1916 there were 401 consolidated Schools in North Dakota with 151 of them open schools, which are schools built in the country and not in railroad towns. From N. C. Macdonald’s “The Problem of Rural School Betterment” May, 1917, p. 16. Professional educators in the early 1900s had several other reasons for promoting consolidated schools, including the expense of educating students in isolated schools having less than 10 pupils, the inability to pay teachers enough so that they could better their training, the lack of social opportunities, and poor sanitation, ventilation, lighting, and heating in the school buildings. Many believed that these schools did not equip students with the knowledge needed to function in a rapidly changing democratic society.4 By 1911 the State Board of Education had begun to reward school districts that chose to consolidate with payments at a higher rate. Town and city school districts also took advantage of the financial opportunity and consolidated. More than five hundred children had spelling bees, played basketball, and performed in school pageants at Wabek School from 1917 - 1960. For example, during the 1936 – 1937 school year, Wabek School hosted a Playday event in which students from Wright, Banner, and Mountrail Schools attended. After 1960 the community used it as a meeting hall, until it eventually fell into disuse. 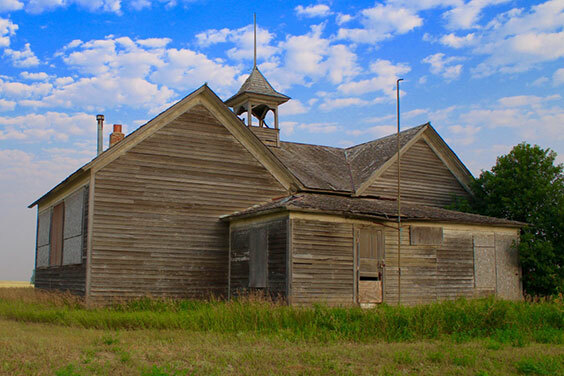 For its unique construction and its representation of the consolidated school movement in North Dakota, the local township community hopes to forestall the demolition of the Wabek School building and is seeking to nominate it to the National Register of Historic Places. 1 Geo. A. Ogle & Co., Mountrail County Atlas, Plaza Township, 1917. Also Hazel A. Frye, Wabek Reunion, Wabek, North Dakota, copied transcript, 1977. 3 Janice Lookhart Ginger, Neil C. Macdonald: Schoolman, North Dakota Mini-Biography Series, (Bismarck, 1986), p. 13. 4 N. C. Macdonald, “The Consolidated School in North Dakota,” December 1915, p. 8. State Archives.